I’ve been trying to write a funny take on how ridiculously stressful it is to walk past yard after yard of dogs that are behind invisible, underground fences and charge me as I walk by. It’s like the ultimate game of dog walker chicken. The dogs are running towards me – there might be a fence to stop them, but maybe not – do I keep passing by or retreat? Obviously I retreat, full of anxiety as I wonder if the dogs are going to chase us down the street. I age a year every time this happens. After years of playing dog walker chicken I look like Cloris Leachman’s older sister. So, yeah, this was going to be funny, but then a dog I love got hurt this week. One of my clients was walking her dog when they passed by a house with a large dog and owner playing ball in the yard. The large dog saw my client and ran at them, slamming hard into her dog and grabbing a mouthful of fur. Every time I walk past a yard where I see dogs charging across their lawns towards me and my dogs I have to think: Do they have an invisible fence? If so will it stop the dogs? I quickly scan for little white flags. Sometimes the flags are there, but sometimes they’re not. Are they not there because there is no fence or because the owners took the flags down? Are those pesticide signs? The clock is ticking. The dogs are charging. Twenty more of my hairs turn gray, my stomach flips, and I do an Emergency U-turn. See: playing dog walker chicken. Also: delivery guy chicken, young children and senior citizens out strolling chicken, and jogger chicken. Look, there are no absolutes in this world, so I’ll be the first to admit that some of these things can happen no matter how you contain (or don’t contain) your dogs. 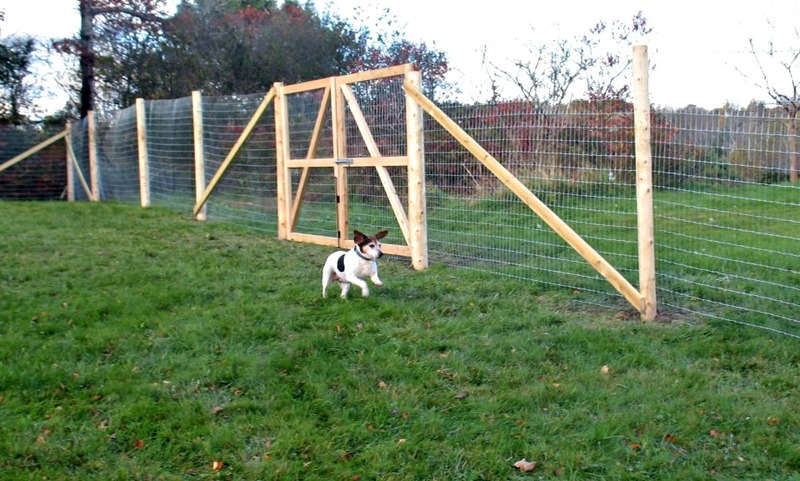 Dogs dig under wood fences, jump chain link, gates swing open. We waited and saved for 5 years until we could put up a fence. Until then, we relied on leash walks and supervised time on tie-outs in the yard. This was Birdie’s first run in her new, fenced-in yard! In the end, if you do choose a hidden electric fence please: Go with a professionally installed product, preferably the Invisible Fence brand, rather than a DIY job. Do the boundary training, slowly and as positively as you can. Make sure your dog has an excellent recall. Never leave your dog unattended. You need to know if your dog leaves the yard. You need to know if another dog enters your property. And know your own dogs. This just isn’t the right fit for every dog. For some dogs it won’t keep them in, for other dogs it has the potential to cause serious issues. Never use them with dogs who have a history of reactivity, fear, phobias, or aggression. And for all of our sakes, can those of you with invisible fences (or no fences at all) stop leaving your dogs unattended in your yards? It’s crazy frightening to see dogs charging you at top speed, white flags or not. And if you think your friendly dog would never do such a thing, I invite you to nanny-cam your yard. Betchya a five spot lots of your dogs are having a blast playing dog walker chicken while you’re gone.